Four new campground cabins will be ready for use in Woodford State Park starting this spring, but right now two of them are nameless. So, we're having a cabin naming contest! The cabins have to be named after native Vermont flowers. So, all you have to do is tell us which flowers we should choose and why! The other two have already been named Gentian and Trillium so all other flower names are available. Send your entry to: parks@state.vt.us with "Cabin naming contest" in the subject. In the email include your name, address, and your names and explanations by March 1, 2012. You can also mail entries to us at 103 South Main Street, 10 South, Waterbury, VT 05671. The lucky winners will be announced mid-March. As their prize, they will able to stay for two nights in their named cabin, and we’ll also post a framed write up and photo in the cabin all season! Red Throated (no, make that a Common Loon) Rescue at Sand Bar State Park! Bill and a friend, named Phelps, were ice skating off Sand Bar State Park yesterday and soon spotted a distressed red-throated loon on the ice of Lake Champlain. The ice was inhibiting the bird from taking off; it was too slippery. They came ashore for advice and more equipment. After several calls, they finally got a hold of Carol Winfield in Westford who walked them through how to capture, transport, and release the loon safely. The two men borrowed an extra car coat from a neighbor of Phelps' who happened by at just the right time and skated back out to the bird. Luckily, the capture was straight forward and went off smoothly. The loon was walked back in rather than skating to reduce the risk of falling with the bird. 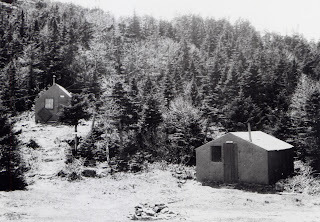 A person wrote to us about the restoration of Camel's Hump as follows: "I came across some old photos of tin huts on the upper portion of the mountain that were used by hikers and, I guess, maintained by the GMC back in the 1920's and 1930's. I understand that those intrusions have since been removed and wonder if you can tell me when this laudable action took place?" A wounded loon could not take flight from his home in Lake Eligo, (Greensboro, VT) when it began to freeze over. This little bird endured a week of less and less open water while fending off bald eagle attacks until his hole finally froze over completely.